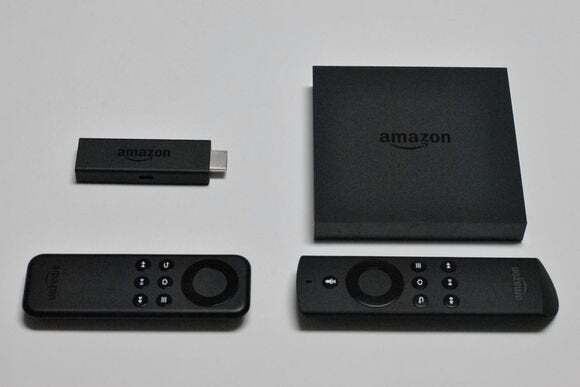 Note: This review has been replaced by a fresh look at the Amazon Fire TV Stick, comparing its features and performance with the latest Roku Streaming Stick and Google’s Chromecast dongle. You’ll find that review here. This article preserves our original thoughts on the Amazon Fire TV Stick. While the Fire TV is a solid video streamer for $99, it’s overkill if you just want an easy way to stream Amazon Prime Instant Video to your television. The Fire TV Stick has nearly the same capabilities at a much lower price: just $39. Here’s hoping that Amazon takes the time between now and January 15 (when it’s able to start clearing backorders) to iron out a few kinks. More on this later. Like other pocket-sized media streamers, such as the Roku Streaming Stick and Google’s Chromecast, the Fire TV Stick is a roughly thumb-size device that plugs into any HDMI socket. There’s a micro-USB port on the long side, which you must plug into either a wall outlet or a powered USB socket if your TV has one. (I got an “insufficient power” warning during setup on my Vizio E-Series television, but the device seemed to work fine on USB power after I dismissed the message.) Amazon thoughtfully provides an HDMI extension cable that lets the stick hang freely in case it gets in the way of your other HDMI connections. Where the Fire TV has a quad-core processor and 2GB of RAM, the Fire TV Stick has a lesser dual-core processor and only 1GB of RAM. That rendered the Stick a wee bit prone to stuttering with some apps. Still, it’s hard to tell much difference even when moving back and forth between devices. The additional processor power mainly comes into play for high-end games that don’t run on the weaker Fire TV Stick (and you’d need the game controller—a $40 option—to enjoy most of them anyway). Amazon’s Fire TV stick and remote (left) aren’t quite as classy as the Fire TV, but they’re serviceable enough for Prime Video. Despite their sizes, the main difference between Amazon’s two Fire devices is the remote control. The Fire TV Stick’s remote doesn’t have the same soft-touch plastic as its larger sibling, and its buttons feel slightly less snappy. More importantly, it lacks a microphone for voice search. Amazon offers a remote control app for Android, but it’s not as convenient to use. The Fire TV Stick also lacks the ethernet port and optical audio output found on the $99 Fire TV. Nothing beats hard-wired ethernet connections for reliability, and the TOSLink port lets you pass audio to an older AV receiver or sound bar that doesn’t support HDMI’s audio return channel (ARC). As with the the full-sized Fire TV, the Stick comes with your Amazon credentials pre-loaded if you order it online through an existing account. Setup is almost a breeze, until you hit the four-minute video tutorial. Not only is it impossible to skip, it’s loaded with painfully obvious tips such as “The Home button takes you to the Home screen of your Fire TV Stick at any time.” This might seem like nitpicking, but these condescending lectures are symptomatic of the Fire TV Stick’s bloated interface. You’ll need an Amazon Prime subscription to get the most value out of the Fire TV Stick, a fact that becomes abundantly clear the instant you land on the Home screen. Sign up for this $99-per-year service, or activate the included one-month trial, and the Home screen lays out a smorgasbord of free videos to choose from. There’s plenty of good stuff, including a trove of HBO hits and Comedy Central originals. The Fire TV Stick is relentless about throwing Prime content in your face. 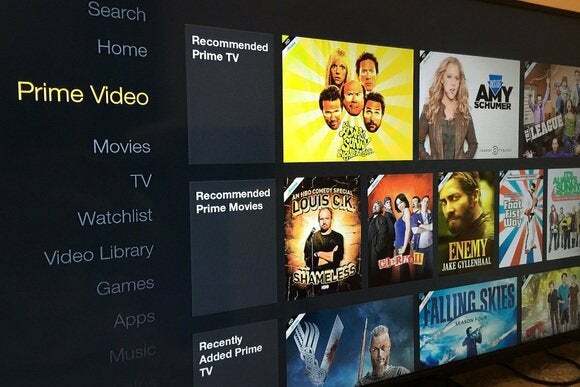 The Home section alone has options for recommended Prime videos, featured Prime videos, recently added Prime videos, HBO Prime videos, and top Prime videos. Those choices are then repeated below the Home section in another area called “Prime Video.” Scroll down to “Movies” and “TV,” and you’ll find many of those categories repeated again. It might seem as though you’re scrolling through a vast menu, but you’re actually looking at the same options over and over. It’s pretty much always Prime time on the Fire TV Stick. All this redundancy buries the non-Prime content. The Fire TV Stick has plenty more to offer, and it’s not just the usual suspects, like Netflix and Hulu Plus. You’ll find a number of lesser-known gems, including Pluto.TV and CBSN. These get so lost in the labyrinthine menus that you practically need to use the search command to find them. Just getting from the Home section to your master apps list requires eight taps on the remote to scroll past the “Video Library” and “Watchlist” sections. Navigating the sprawl can be exhausting. 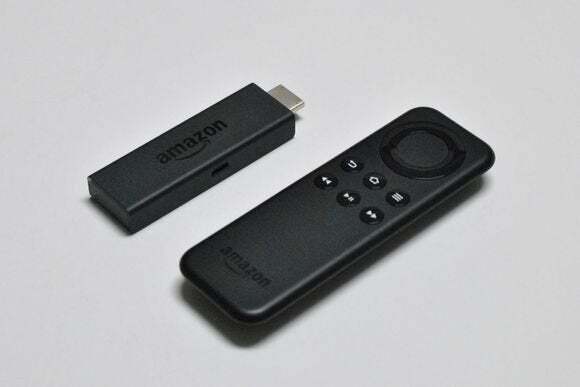 The Fire TV Stick nods in the direction of the Chromecast with some ability to fling videos from a phone or tablet, but its scope is more limited. The Fire TV Stick works a lot like a Chromecast with Netflix and YouTube, for example. Open the app on your iPhone or Android phone, pick the video you want, and hit the “Cast” button to play it on your television. Amazon says this works with Spotify, too, but I wasn’t able to test it out as it requires a Spotify Premium subscription. That’s where the similarities end. The Chromecast supports casting from a wider range of apps, and if it’s plugged into a wall outlet, it can even turn on your TV and switch to the appropriate input. I also had trouble getting screen mirroring to work on the Fire TV Stick, and the process—which involves opening a prompt in the settings menu and entering a PIN on your phone or tablet—is much clunkier than Chromecast’s mirroring setup. Unlike Chromecast, the Fire TV Stick does let you cast Amazon videos to the television while you look up supplemental information (such as actor and director filmographies on IMDB) on that second device. But you need a Fire phone or Kindle Fire tablet to do that. I wasn’t able to evaluate this feature for lack of the necessary hardware. The Fire TV Stick established a solid connection only to my wireless router’s 5GHz network. It connected “with problems” to the router’s 2.4 GHz network, which is more crowded but delivers longer range. None of my other streaming devices exhibit this issue. The remote control is finicky. Sometimes it fails to register button presses; other times, a single button press repeats many times in a row. The remote-control app for Android failed to recognize any of my voice searches on a Nexus 6. You can’t browse Prime Music playlists or genre stations directly from the Fire TV Stick. You can add playlists from another device, but I had problems getting them to sync right away. I’ve come to expect these kinds of issues from version 1.0 products, but that doesn’t make it right. Manufacturers shouldn’t punish early adopters. If you don’t want to pay to bug-test a new product, give Amazon at least a month and a half to exterminate the biggest ones in this device. The Amazon Fire TV Stick is small enough to hold in your hand. 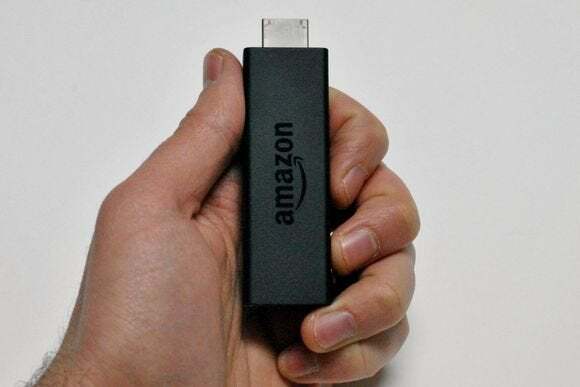 Despite the number of cons that have piled up in this review, I still believe the Amazon Fire TV Stick is a good value, especially for Amazon Prime subscribers. If you don’t think you’ll use all the features that the pricier Amazon Fire TV delivers, don’t spend the extra money to buy it. But Amazon has some cleanup to do before I can call this stick a clear winner.